Hormone-Free Appetite & Weight Control Drops with African Mango Extract! HCG Drops PURE is the HOTTEST weight loss solution in the country right now! The Drops trigger the body to release and mobilize any extra fat it's carrying to use as an energy or food source. 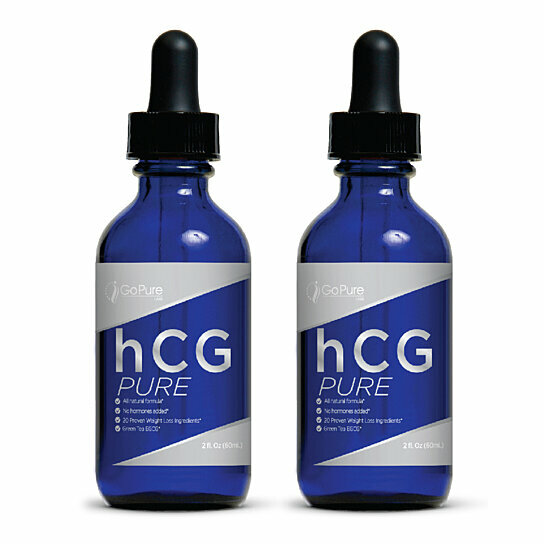 Therefore, when you go on a very low calorie diet, HCG Drops PURE helps make up the difference in the calories it needs to function by using your stored fat as food. As a result, you will burn fat more quickly, and from areas that are typically harder to reduce. An additional benefit of HCG Drops PURE is that you will feel fewer hunger cravings and desires to snack between meals, despite undergoing a calorie-restricted diet. This will help you maintain your diet and improve your motivation to continue. Even more significant than the laboratory research on African Mango (Irvingia Gabonensis) is the human clinical research which shows dramatic weight loss and belly fat reductions across the board in all of the studies that have been completed thus far. African Mango taken twice daily for 10 weeks has been shown to help people lose up to 28lbs and remove up to 6 inches from their waist measurement. Now, you may enjoy the powerful effects of HCG Drops PURE without the costly, painful injections. With HCG Drops PURE with African Mango, you have a winning combination to help you lose weight fast! Why not try it today? What do you have to lose, other than the extra pounds? Product may ship with hCG or Skinny transformation drops label, but will contain the exact same ingredients.